Tiia Ourila | Yoga Kula. Preparation is a key factor in how I approach creating a class and how I feel best practice can be achieved. The class always starts by finding a connection to one’s body and mind. Tuning into the inner wisdom and listening to the feedback our bodies give us. Then we can apply accordingly, every day is different, every practice is different When the mind is focussed and aware and our senses are turned on- we can start practicing. I call it CLAP; Connect, Listen, Apply, Practice. Once we do that we can give ourselves a clap – feel that we have succeeded in doing something beneficial to our well being . I like asanas to move and flow from one to the next , creating the sense of moving meditation. I use mobilisations and awareness of breath to make the body and mind feel ready for more challenging asanas and whilst we find stillnesses in the practice we continue flowing inside the breath. I would call the class a total body workout, however the word “workout” feels too limited so perhaps total “body experience” would describe the class in a best way. We will cover variety of postures that work on twists, back bends , hips , core stability , balances etc. A mixture of everything really. I will offer challenging options for those desiring to work to their edges whilst also making sure everyone feels included and able to modify the practice to fit their needs. 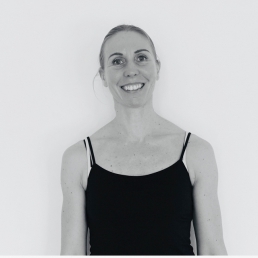 I personally work best in a positive environment that encourages to me to achieve my best and have a positive journey so I try to create a welcoming and supportive atmosphere for everyone to enjoy their practice and the community we create. My first experience of yoga was 14 years ago .i didn’t have a regular practice then, I felt Yoga was something that supported my dance career and it was an answer to a need rather than to a desire. Gradually over the years came back to Yoga more and more and about 4 years ago I got the ‘ yoga bug’. I totally fell in love with Yoga and the journey has been amazing since then. I used to practice mostly Ashtanga but now my practice is much more varied. I got introduced to Yin during my TTC and I absolutely love Julia Knight’s classes. I am learning something new all the time. I would say I am still in the beginning of my Yoga journey. I have a lot experience in movement through my dance career and this knowledge stands as a base for my yoga journey whilst my knowledge of Yoga is growing day by day and I continue my development as a yoga practitioner. I love to be a ‘student’ and with Yoga your journey continues as a student, there is always something to learn and experience.